Our new book selection from the library brought me more cow sightings than I expected today, and yet, my featured cows are coming from a movie called Barnyard: The Original Party Animals. No, I’ve never seen this movie and I didn’t watch it today. 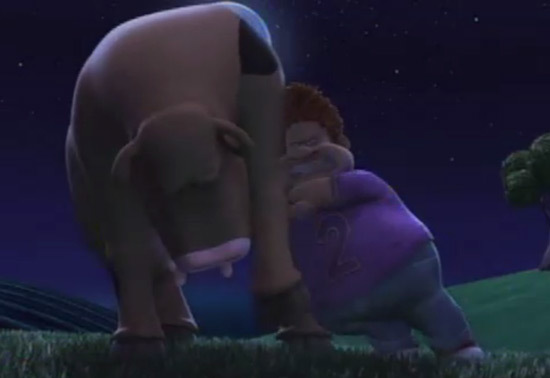 After seeing the Barnyard trailer on IMDB, I don’t think I really want to see the movie, now or ever. So why did I watch this movie trailer? Well, a fellow blogger at GeorgeFloresWrite stopped by the other day and today again, suggesting I check out this movie. His reason for it? Apparently the cows display some weird looking udders. You know me, I had to see things out for myself. Wow, the man is right. These are the most disturbing cow udders I’ve ever seen! I don’t even know what these udders look like. Maybe a big rubber cup with short legs stuck upside down on the cow’s belly? 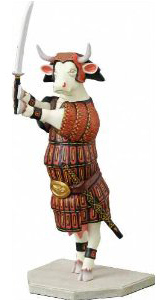 Have the movie illustrators even seen a cow? The cows (and the other barn animals) seem to have a lot of fun in this movie. Time to party! Here they are, enjoying a joy ride. and coming to the rescue of a poor fellow cow, who falls victim of cow tipping (remember my first ever cow tipping story?). 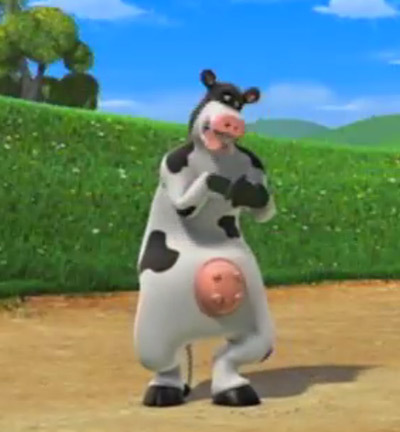 If you’d like to see more for yourself, feel free to view the Barnyard movie trailer here. And if you’ve seen the movie, I want to hear all about it! Previous Post Meet Benny the Bull, from Chicago! Your cow today looks so much more classy, and I’m totally stealing it! I have seen the movie. It’s been awhile, but I think we enjoyed it. I remember LOVING the scene where they tipped the boy guilty of cow tipping out of his bed in the middle of the night. I also enjoyed the animals’ innocent expressions every time the farmer came to check on them. The part about the animals pretending nothing is going on looks quite funny. I’m glad to hear they got back at the kid tipping that poor cow! :) Thanks for checking out the movie. 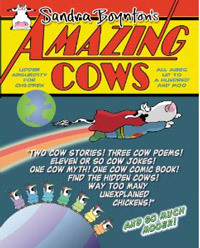 The really disturbing part is that those udders are on male “cows.” That is what freaked me out about this movie. It was a real gender-bender of a movie! Maybe. That’s really the best explanation I’ve heard. Still, I don’t have a clue why no one connected with the movie didn’t put a stop to the udder madness (sorry, couldn’t resist). Ok, that cow is really disturbing! !